There are many reasons why you should come to visit us, but the main one is easy to point out: The mighty waterfall Ristafallet!! It doesn’t matter if you only want to visit the falls, enjoy something in the restaurant or stay on the campsite in a cabin, caravan, mobile home or tent. We at Ristafallet camping and Restaurang are here for you, working at making your stay into a fine experience. You can read more about who we are if you click here, but we already want you to know that we love our place because it is so nice and peaceful. We don’t have many activities on site (except for guided tours when the waterfall is frozen) because we feel that this special environment is meant to release from stress and everyday problems. 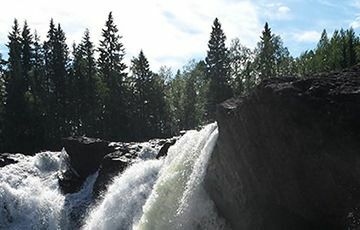 Ristafallet waterfall in the western part of Jämtland is listed as one of the most beautiful waterfalls in Sweden. You can see the waterfall from the campsite. 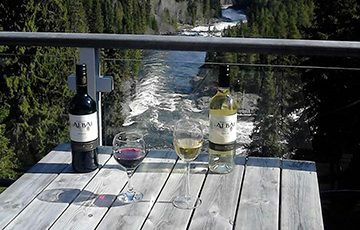 In our café/restaurant you can enjoy your food while admiring the beautiful view on the river Indalsälven. The campsite doesn’t have clearly marked plots which gives a more natural feeling. It’s situated next to the river Indalsälven and the Ristafallet waterfall. On the campsite there are 8 cabins. 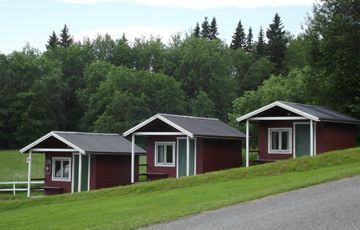 The cabins are suitable for 4 people. 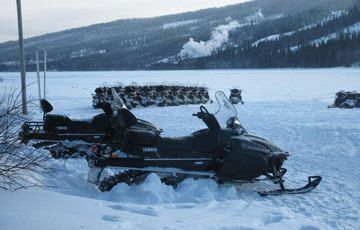 The campsite is the perfect base for exploring all that Jämtland has to offer. Camp on this spot? Make your reservation today! 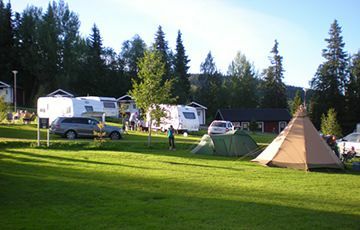 Ristafallet camping in Åre is a member of the swedish campsite organisation SCR. 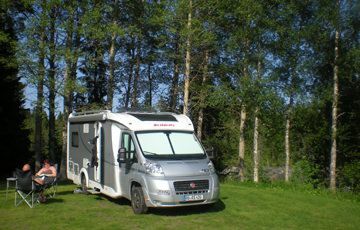 To check in on our campsite we use the camping key Europe camping card. If you don´t have a card or need to update your membership we advise you to order here so you can benefit all the advances like discount on ferries and so on. Do you want to travel to Ristafallet Camping & Restaurant? Use the google maps route planner to find us! And affiliated to Camping Key Europe.